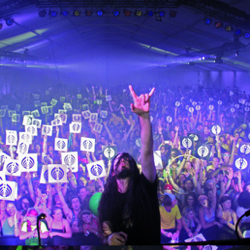 We have ended voting in the first phase of our Dollar Per Bass Head campaign, and are thrilled to donate $50,000 on behalf of the Bassnectar community to some very worthy causes. We’ve been collecting $1 from every Bassnectar ticket sold to donate to nonprofit organizations that do amazing things to empower education, health or community. For this first phase we set aside $50k of theses funds that you helped raise, and asked you to vote between three organizations that you felt needed the most support, the funds being allocated accordingly – the organization with the most votes receiving $25k, the runner up $15k, and the third finalist $10k. Thank you for your time and money and energy supporting organizations that support YOU! We truly believe in their mission statements and are humbled to help shine a light on their causes. Many thanks to our friends at Air Traffic Control, a non-profit that helps artists optimize their opportunities for social contribution, for their invaluable contribution to this campaign. Please take some time to read about these organizations, learn more about their mission statements and lend your support wherever possible. This is not only a great way to give back, but it is also an awesome way to meet new friends, and to explore life OUTSIDE of the party.